Have you ever wondered how the landscapes we live in are structured linguistically? How does landscape related lexicon and grammar differ across languages and why? This book—a result of the collaboration between the author and the interdisciplinary project Language, Cognition, and Landscape at Lund University—explores these intriguing questions from a number of vantage points. 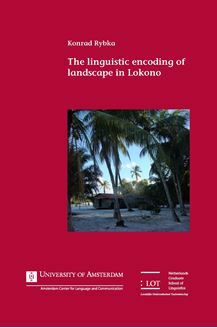 It offers the reader a detailed examination of the linguistic means used to talk about landscape in Lokono—a critically endangered Arawakan language. The Lokono people live in Suriname, Guyana, and French Guiana; this book focuses on the Surinamese dialect. Its geographic focus in turn is the border area between the grass savanna and the tropical rainforest, riddled by a number of creeks and rivers. The book caters for the interested semanticians, who will find here a comprehensive description of the landscape-related Lokono lexicon. It also offers new insights for descriptive linguists and the linguistic typologist, whom it provides with a comparative analysis of landscape-related grammar in three unrelated languages. The book contains also an elaborate description of the Lokono grammar of space. This allows the reader to locate the landscape-domain—that is, the realm of geographic-scale space—within the larger domain of the linguistic encoding of spatial relations. Being the first detailed description of spatial relations in any Arawakan language, the book is also an invaluable source of information for any linguists interested in the cross-linguistic study of the grammars of space. The book is also rich in cultural information pertaining to the landscape domain, offering the linguistic anthropologist a glimpse of the Lokono subsistence practices, material culture, and traditional beliefs inextricably linked to the local landscape. Finally, the interdisciplinary setting, in which the book took its shape, rendered the book appropriate for other audiences interested in landscape, particularly cognitive geographers and landscape ethnoecologists.